This residential property is an ‘A’ frame house; the frame being constructed of glue laminated beams which are seated externally into galvanised steel shoes. Moisture has been trapped within these shoes, allowing moisture to track up the end grain of the glue laminated beam. 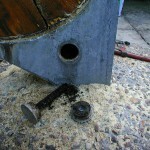 The pins holding the beam into the shoe were heavily corroded. 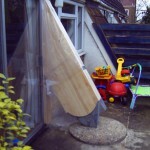 The remedy – To support the beam within the building. The glulam repair was carried out in two phases to reduce the temporary works. 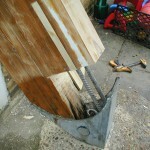 The first stage was to remove the damaged timber laminate strips until solid wood could be found. 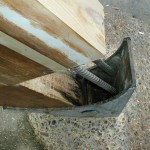 Shear connectors were fitted into slots in the side of the beam as access was restricted by the shoe and the ground. Stainless steel rebar was chosen for this project as it performs well in compression. 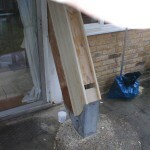 The rods were bonded in place using Rotafix Structural Adhesive (RSA) then covered with timber slips to cover the repair areas. 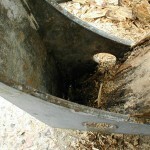 It was not possible in this instance to replace the damaged timber with timber due to the awkward shape of the shoe and the limited access. 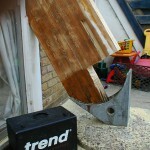 The decision was taken to cast a new rafter foot using Rotafix TG6 Structural Grout. Rotafix TG6 was the ideal choice as it would not be affected by water gathering in the shoe in future, it would bond easily to the timber and to the rods and is a two- part epoxy adhesive filled with a fine aggregate filler that would perform well in compression. To shape the TG6 to the form of the beam and the shoe, shuttering was built around the beam, this formed a mould. Rotafix TG6 was poured via a hopper system into the steel shoe, ensuring that any water entering the shoe in the future would not affect the timber beam. The repair to the beam was completed by cladding it with a simulated glulam beam to give an improved aesthetic appearance. 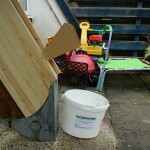 This method of construction was common in the 1970s in domestic and public buildings. Rotafix have received many similar requests for assistance in overcoming issues such as this. If you are considering a structure where the timber or beams are going to be attached mechanically to the ground then Rotafix will be happy to assist you in designing the connection to avoid the issue of end grain decay as a result of moisture. For further information about the Resiwood system of repair, using TG6 Timber Grout or designing connections to meet your requirements please contact us on +44 (0)1639 730481 where one of our technical team will be happy to assist.